There are a lot of fantastic things one can get up to in the summer. There is fresh produce to gorge on, BBQs to get silly with friends at, new music to discover and just general tomfoolery to be had. While I was home in Oregon, Linz and I found ourselves having an epic day that involved them all. It started off simple, I wanted to try making this cherry pie from the Adventures of Cooking for a gathering with friends. But of course things got a little complex. 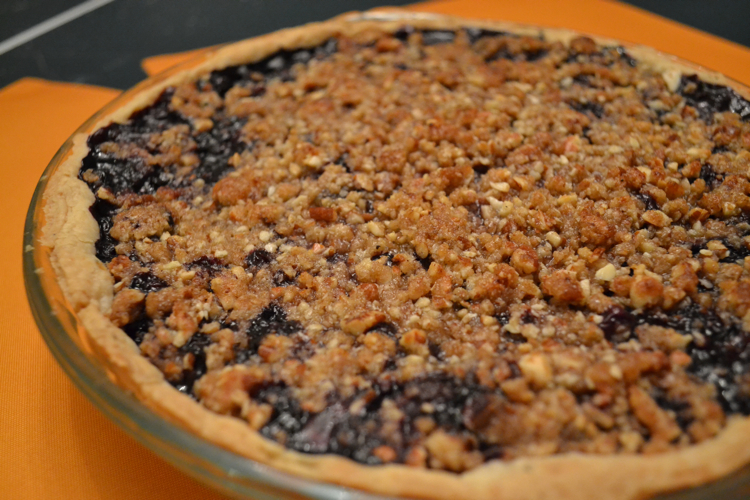 We had to change it up to include the fresh blueberries we had just picked. Our usual shenanigans don’t include a newborn, but it turns out baby coos and cries only add to the fun. Also, there was the small problem that Linz is not that into pie crust, while I love it. What is a duo to do? Have The Best of Both Worlds of course. 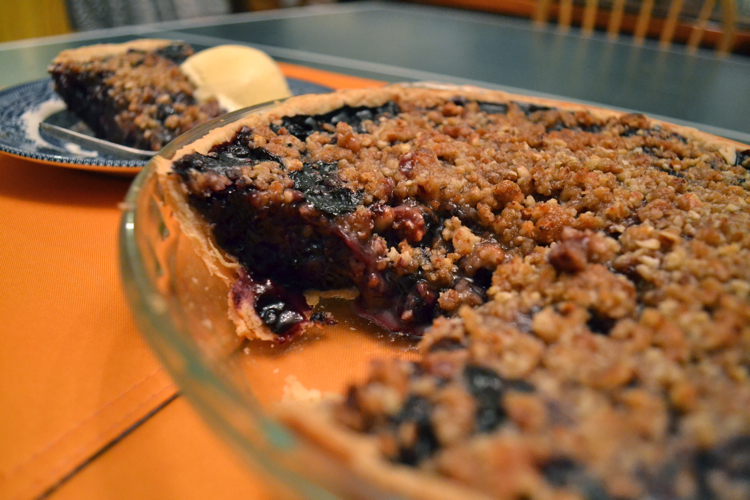 Linz and I would like to introduce you to the Hannah Montana Blueberry Pie. 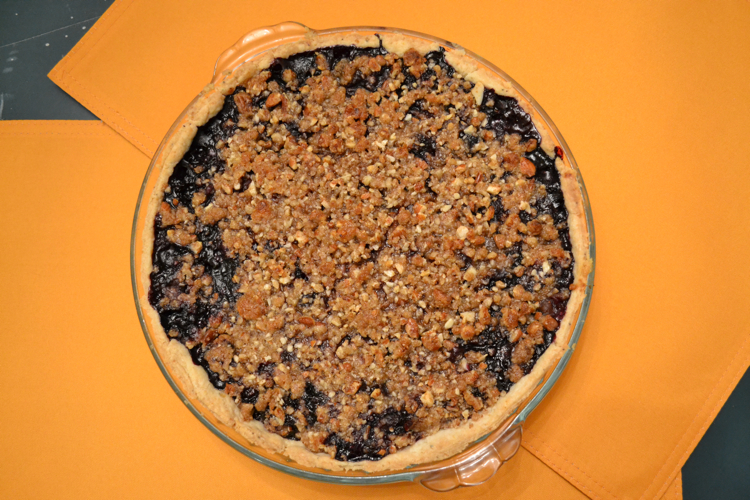 Balsamic blueberry filling, black pepper pie crust with a pecan crumb topping. It’s so crazy it actually works. Filling: Combine blueberries, flour and sugar. Mix until blueberries are well coated. Add vinegar. Once filling is added to pie crust, top with honey, lemon juice and butter. Pie Crust: I haven’t included an exact pie crust recipe because I’m guessing you have your own favorite. You’ll need enough for the bottom and sides of a 9-inch pie pan. Martha Stewart has a classic. 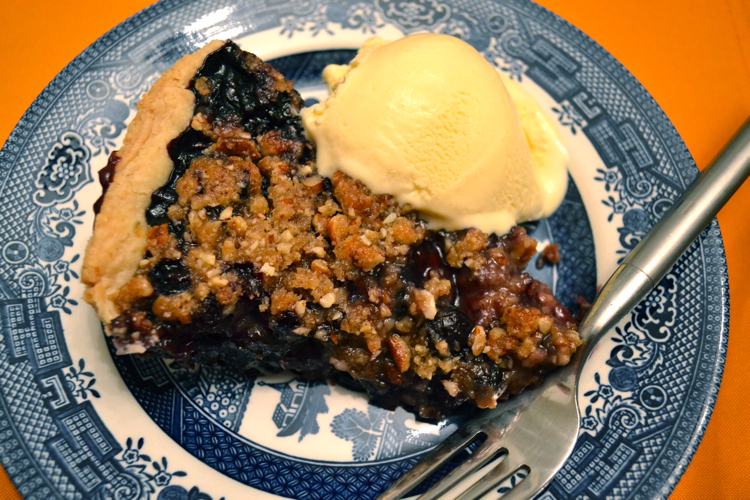 Both recipes we adapted this pie from have a recipe. If you are looking to improve your skills, these tips are worth checking out. Topping: Stir together the dry ingredients until combined. Pour melted butter over the top and stir until moistened. Sprinkle over the pie. Cover in foil and bake for 40-50 minutes, removing the foil for the last ten minutes. That just about covers our day of fun. Except of course for the new music. A pie as sweet as this needs to be paired with a ridiculous song, right? Linz and I thought the same thing. But wait, there’s even more to chat about! I guess this pie recipe is getting out of control and calls for some real talk. I’m sure you are curious if this pie is at all inspired by Miley Cyrus’ performance at the VMAs. Actually Linz and I made this recipe and name before that live, bear costume, dancing performance. Then the question between us became, do we reference this pop culture event that’s set twitter (and more!) on fire in our post where we had already planned to include Miley Cryus references. My instincts went like this: no way am I putting her down with trite comments, I think nothing positive would come from me pretending to be clever at her expense. I then thought the best idea was to just mention in passing how Linz and I were cool and timely and move on. Buuuut, I suppose the truth is best. When we made the pie and we came up with our silly Hannah Montana reference, we also talked about Miley Cyrus and her recent music video and the issues around culture appropriation. Since the VMAs I’ve seen more articles popping up on this issue. This is mostly a crafty corner of the Internet, but Linz and I are passionate about events in our society and sometimes our playful ideas come up against real issues. This is an interesting example of how our fun day of pie making intertwined with other passions of ours. If you are curious to learn more about some of the issues of culture appropriation we talked about, a great starting place is this article. Life is complex. Sigh.